BEEF BROTH (WATER, BEEF STOCK), CARROTS, POTATOES, TOMATO PASTE, PEAS, SUGAR, PASTA (WHEAT FLOUR, EGG WHITES), CORN, POTATO STARCH,BARLEY, GREEN BEANS, SALT, CELERY, VEGETABLE OIL (CANOLA, CORN, COTTONSEED OR SOYBEAN), MONOSODIUM GLUTAMATE, YEAST EXTRACT, SPICE EXTRACT (ONION), HYDROLYZED SOY PROTEIN, CARAMEL, HYDROLYZED WHEAT GLUTEN. 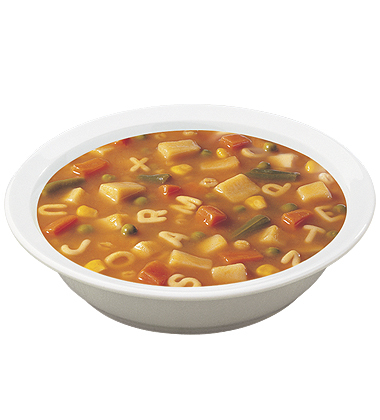 A beef broth mixed with carrots, potatoes, peas and alphabet pasta. In a 4 quart pot, combine one can of soup and one can of water. Simmer over low heat, stirring occasionally.